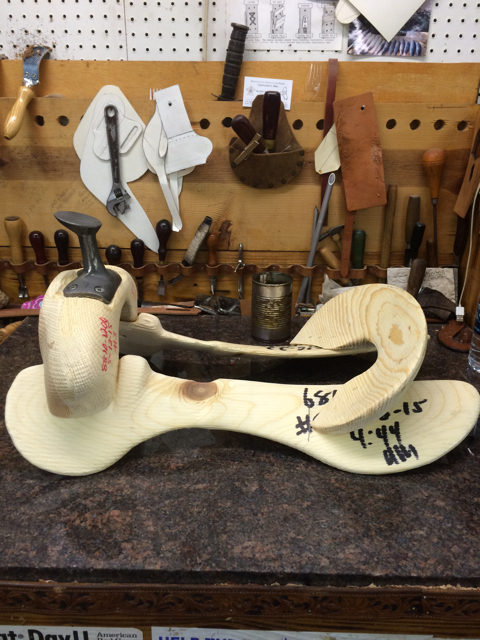 Many people know that the frame that a saddle is built on is called a “saddle tree,” but they are usually vague on exactly what a saddle tree consists of. 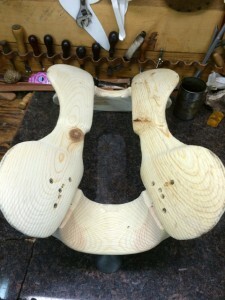 In this post I will discuss the components that come together to make up a saddle tree. All quality saddle trees are made out of wood… usually a type of pine wood, but many of the high end custom tree makers have their preferred types of wood for different parts of the tree. I am not, by any means, a tree maker so I will not get into the science behind this. If you are interested in a very in depth look into the custom tree making world, I highly recommend visiting Rod Nikkel’s Blog. I do not know Rod personally, and have not used any of his trees yet, but I have followed some of his work for years and thoroughly enjoy his blog for information about fitting, tree construction and much more. What I want to discuss in this post is the basic components of the tree so that you can see wants under all that leather that makes up your saddle. The photo above is of a tree sample we had sent to us in what we call “in the wood,” which means it hasn’t been covered with fiberglass or rawhide yet. We had these samples sent to us for inspection on some new styles we are working on. The majority of saddles today have a metal horn that is mounted to the swells using screws or bolts. After the horn is installed the area around the horn is filled with bondo or a filler to make this area smooth and level during the covering of the tree. The swells or the front, is cut from one piece of wood and this is the part of the tree that determines the style of the saddle. This photo shows a TM front which would make it a competitive roping saddle. Many custom tree makers will laminate there fronts from multiple pieces of quality woods and also using a high quality piece of cabinet grade plywood to add strength to the front. On many trees that have a “wood post” horn, the horn and front are one piece. This style of tree does not have a metal saddle horn bolted into the front. 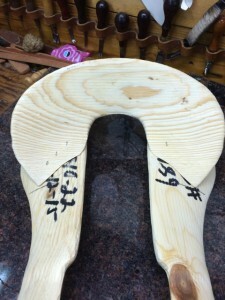 The horn and front being cut from one stock of wood makes this style the strongest style available and is seen in many Wade style saddles. 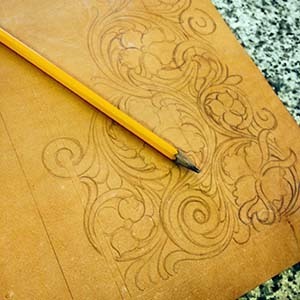 The cantle of the saddle tree is much like the front in that it can be cut from one stock of wood, or in the case of high end custom makers, will be laminated with multiple pieces for strength. Cantles have many different styles, angles and heights. These are usually set to the specs of the customer and can be changed to suit different needs. The cantle is also the portion of the tree that sets the seat size. The cantle gullet, or tunnel, is important in saddle fit as it sets the width of the space between the two bars. Along with the hand hole gullet, gullet width and bar spread measurements, the overall fit of the final saddle can be adjusted and made to specs for a particular horse. 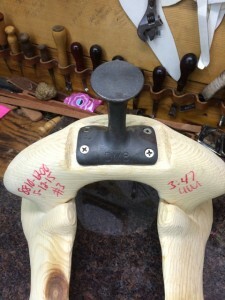 Every saddle tree has two bars and this is area of a saddle that is most important when dealing with saddle fit. There are many different styles of bars out there but the majority of quality saddles use an Arizona style bar or some variation of that. An Arizona bar has the best rock, flare and twist of most bar styles and the bar pads are nice and large for more surface area contact. The discussion around bars can go on for days and everyone has their own opinion of the best bars. I will wait to dive deeper into this topic on later post. The main take away here is the parts that make up a tree. Although the wood that makes up a tree and the way each individual piece is assembled are important to the overall strength of a tree, the material used to cover the tree is actually what gives it its ultimate strength. The two most popular materials used to cover trees are rawhide or fiberglass. I will get into the pros and cons of these two materials in a future post. If you would like to dive deeper into the tree making process, I suggest visiting Rod Nikkel’s website. He has done a great job of breaking down the science and art behind this process.